By Justin C. I was first introduced to Shroud Eater four years ago, by Ulla on this very blog. You can see from my comment on the post that I really liked Dead Ends. 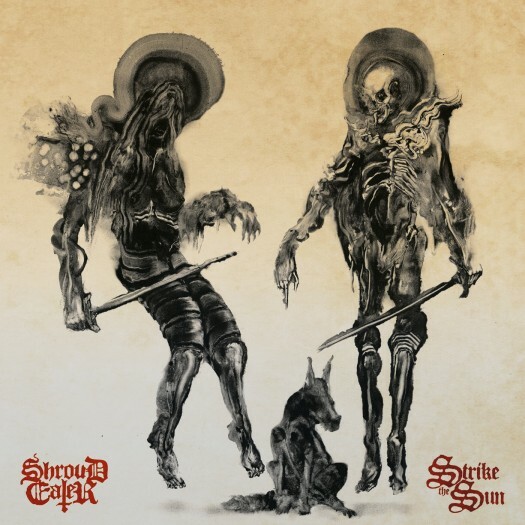 Finally, we're treated to a new full length, Strike the Sun. I was first introduced to Shroud Eater four years ago, by Ulla on this very blog. You can see from my comment on the post that I really liked Dead Ends. Finally, we're treated to a new full length, Strike the Sun. If the band's 2015 EP, Face the Master, was a quick, one-two punch of sludgy fury, then Strike the Sun finds the band spreading out nicely into a full length, with atmosphere to spare. (I have to confess at this point that I missed an intervening split and single after Face the Master, but I'll have to rectify that situation soon.) The filthy, endless bottom end that hooked me on Dead Ends is still present and accounted for. I think they've managed to distort the very fabric of time and space. The album might open with a low-level fuzz contrasted with ethereal cleans, but "Iron Mountain" opens with that familiar, dirty crawl, and eventually builds into a stomping rager about storming gates and climbing towers. To make sure you don't forget Shroud Eater has more to offer than distortion upon distortion, they also offer up an instrumental, "Another Skin," that's packed to the brim with riffs. "Dream Flesh" offers a short respite, focusing more on the eerie atmosphere and lovely clean vocals, but the simple-but-thundering bass line doesn't let you forget where you are and where you're about to go. "It Walks Among" kicks off the album again with more raunchy, stomping, sludgy goodness. I may have lost track of the band for a few years, but I have to say I'm just as taken by this album as I was when I first heard Dead Ends a few years ago. Strike the Sun gives us more Grade-A meaty metal, but expands the band's template in all the right ways. Aaahhhhh, this is sooo good! I loved Thundernoise, but they've really grown/matured, while stillh aving that typical growly sound I love! (Actually, reading back, it seems you joined in from Dead Ends EP?? Then quickly go and check Thundernoise too, it's great!